Fall Out Boy: Folie A Quatre? Fall Out Boy bassist Pete Wentz is a busy boy, marrying singer Ashlee Simpson and siring the couple's expected first child. But he and the rest of Fall Out Boy found time to record a new album, Folie A Deux, due November 4. Speaking about the album title in the video posted on Fall Out Boy's website, singer/guitarist Patrick Stump says, "Folie A Deux is French - and obviously I don't speak French, sorry - but it translates to 'the shared madness of two'." And with that he gives a pointed look toward his songwriting partner Wentz. In the same video message, Stump also reveals that they have made a mixtape available to download free. On the mixtape are bands such as Panic At The Disco, The Academy Is..., Gym Class Heroes, among others. 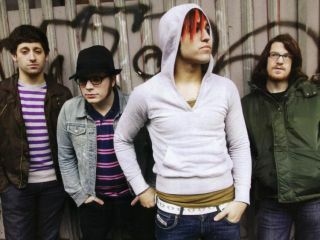 In other news, Fall Out Boy have been nominated for a 2008 MTV Video Music Award for Best Rock Performance for their video of Michael Jackson's Beat It.